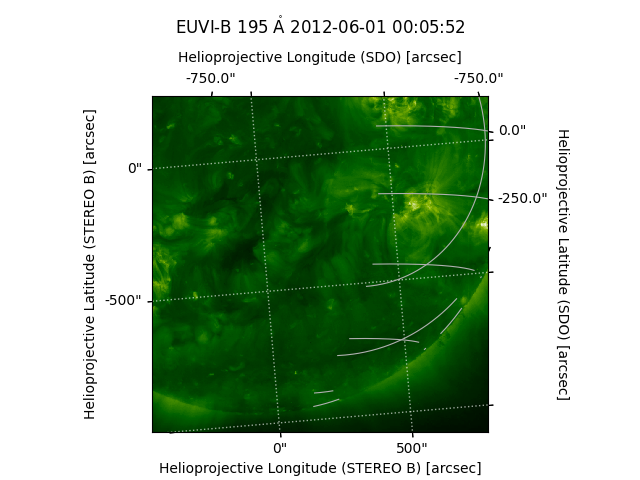 In this example we use a STEREO-B and an SDO image to demonstrate how to overplot the limb as seen by AIA on an EUVI-B image. Then we overplot the AIA coordinate grid on the STEREO image. Calculate points on the limb in the AIA image for the half that can be seen from STEREO. r = maps['AIA'].rsun_obs - 1 * u.arcsec  # remove the one arcsec so it's on disk. We can also plot the helioprojective coordinate grid as seen by SDO on the STEREO image. # Move the title so it does not clash with the extra labels. # Change the default grid labels. # Add a new coordinate overlay in the SDO frame. # Set the ticks to be on the top and left axes. # Wrap the longitude at 180 deg rather than the default 360.